As this weather draws in and we start to think about warmer time, what are you going to do next summer? Let’s start with a question – who has heard of the international camp staff programme? Each year, the Boy Scouts of America invite Scouts aged 18-30 from around the world to come to the United States and spend the summer as an International Camp Staff member of a BSA summer camp or Cub Scout day camp. Be approved by The UK Scout Association. Be able to teach Scouting skills to Scouts in a summer camp programme. Be available for at least six weeks beginning in June. I guess the follow-up question is what is Camp Staff really like? In 1998 I applied to the International camp staff programme (surprise that hey). I was accepted and in the summer I headed of to the US to spend the summer working at Camp Long Lake in Wisconsin. work with the Director for High Adventure to run the COPE (Challenging Outdoor Personal Experience) course. when not doing the above I also assisted as a Lifeguard and as a Canoe/Kayak Instructor. One key event that happened on Sunday was young people signed up for activities. As a staff member on an activity, it was time to put your best salesman voice on and sell your activity. Monday – Thursday: these were split into Morning and Afternoon activities sessions, where the young people would, in a large number of cases, work towards merit badges. For me, Tuesday and Wednesdays were my days. Tuesday was 5-mile hike day and Wednesday was COPE day. Depending on the number of young people who have signed up. It was the case that most weeks the 5-mile hike went ahead but not every week the COPE course ran. When I was not involved in these two activities, I assisted as a lifeguard in ‘Aqualand’ or over at the boathouse instructing Canoeing and Kayaking. It was the case that most weeks the 5-mile hike went but not every week the COPE course ran. When I was not involved in these two activities I assisted as a lifeguard in ‘Aqualand’ or over at the boathouse instructing Canoeing and Kayaking. After dinner every day there was some form of evening activity. This could be Staff vs Leaders Volleyball or the “listen to the British bloke talk” campfire (held on a Thursday). Wednesday evenings the Scouts cooked in their campsites and the staff enjoyed the pleasure, most of the time, of visiting the campsites and eating the cooking. Friday was the campwide relay ending in Aqualand for Aquafest. Aquafest including the infamous Slippery Watermelon challenge. Imagine five staff members trying to hide a watermelon underwater covered in Crisco (Lard for the Brits) and stop it from being carried from the swimming area to the bank. Saturday was departure day. As a staff member it was about getting your assigned task (cleaning the shower blocks, taking kit to campsite x or cleaning out the kitchens) completed so you could head home for the weekend. Most Saturday/Sundays there was then a Cub Scout overnight camp starting on Saturday afternoon and running to Sunday mid-morning. I worked quite a few of these because it was a bit far to go home. Your week then repeated for the Camping Season which is between eight and eleven weeks. The thing that really came as a shock to me was, you were paid to be there. I got about $100 per week, which when you getting all your meals and accommodation free makes it a nice little earner. So Why be on Camp Staff? If you ever fancied exploring the US this can be a great way to start, you spend eleven weeks getting to know people in scouting and can give you a real foothold for travelling. It gives you a link to scouting people who are willing to help you out if you visit their area or city or town. You can also earn and save extra money to support travelling and the end of the camping season. “But I could do Camp America or BUNAC” I hear you say. Well yes, you could. However, I have spoken to people who have done this and they all say they found it quite intense. having the kids be your responsibility week morning, noon and night. 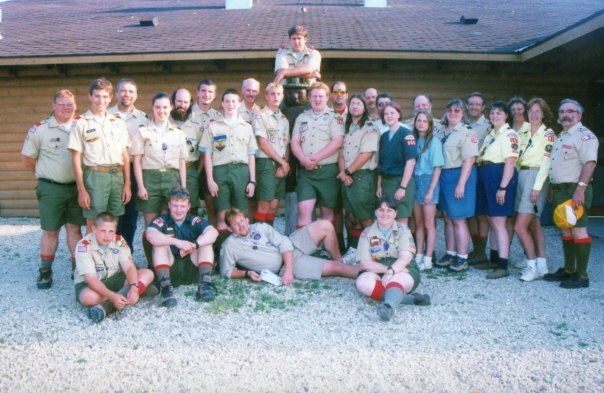 The great thing about the BSA Camp is that the young people come with their leaders, so once activities were over in the evening, they went back to their campsites and their leader and you were free with your fellow camp staffers to enjoy yourself. Each camp will have different rules, the rule on our camp was you had to tell the camp warden you were going off-site and you had to be back on site for breakfast. Miss breakfast and you would be in trouble the Warden had a number of jobs saved up for those who were not there. Just off the camp where I was there was a bar where the staff went to play pool, darts, table football and eat pizza. Some evening some staff members to head off to a local town to go to the cinema. Any Recommendations before I sign? A couple of thoughts/recommendations if your thinking of joining the Camp Staff Programme. The default role for the international camp staff member is something call Scout Craft (knotting, lashing, knife, axe, history of scouting). If you have outdoor experience sell it, you don’t necessarily have to hold the UK Scouting Activity permit to support the activity in the US (or you did not when I did it). It just me but I preferred to be lifeguarding and canoeing as oppose to teaching knots. I would go again in a heartbeat (Sadly I am too old), I had a great time made some lifelong friends on or through the camp and I now always have a bed if I ever want to visit the Milwaukee area of the USA. It was also a great way to experience Scouting and meet Scouting people in another country. So tell me, have you head of the International Camp Staff Programme? Have you been on it? What were your experiences/thoughts? Firstly, you lucky git. I remember when I was probably 16 reading about Camp America, and I was planning to go as it looked brilliant, but then school and work got in the way. I’ve never heard of this particular International Scout Staff program, and I imagine if it was publicised more, it would get swamped with eager Explorers. I myself have always wanted to attend international Scouting events like Jamboree’s but life or people always seem to get in the way. I remember as a Scout wanting to go to the Jamboree in Australia, they held a competition to send one Scout from our district. The competition was run by our group’s GSL, the winner of the competition, our GSL’s son. I remember feeling gutted and everyone knew it was fixed. I would say you should get the info for this International Staff Camp and promote it when the time comes, as I can see so many young people wanting to do this if they knew about it, like you did. I am not sure how old you are but the International Camp Staff programme accepts applicants up to the age of 30, so maybe there is still time. The details for this are all on the scout associations website http://scouts.org.uk/supportresources/search/?cat=52,206,398. so anyone can find them. As for the Jamboree there is still time I never got to a Jamboree as a YP but I went as an Adult. Sadly I’ve just turned 38, all the fun stuff fast gone. But got two son’s in Cubs so hoping in a few years to be packing them off to various places around the world.